I wish I could remember where I originally found this recipe- definitely a Pinterest find from a couple years ago! 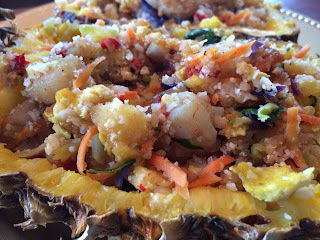 It is super versatile and each time I make it, I change the ingredients and my carb if choice! 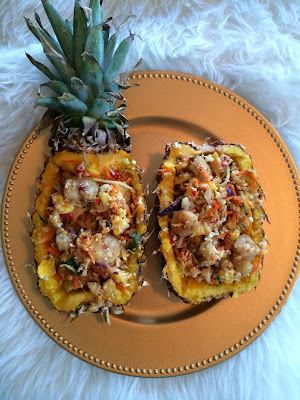 It is one of my favorite entertaining meals because the presentation is awesome! Anytime you can make food-in-food, it is a definite hit! Think mini apple pies in apples! 1. 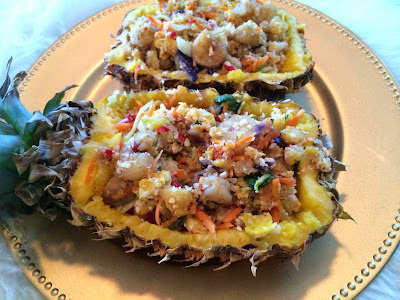 Cut your pineapple in half lengthwise and scoop out all of the pineapple so you have the shell as bowls! Chop up the pineapple fruit! Depending on how round your pineapple base is, you may have to even it out so it sits evenly, by cutting a flat tiny base on the bottom. *at this time, either cook your rice or quinoa or 'rice' your cauliflower. To 'rice' it, you just put it in your food processor until it looks like rice! Same as you would do with a cauliflower crust pizza. 2. Chop and sauté your onion, bell pepper and garlic. 3. Add your shrimp or protein and cook on medium until almost cooked through. Season as desired. We season with no-salt added seasonings or dried herbs. My favorite is something spicy like cayenne or paprika. 4. Add your broccoli slaw and shredded carrots- add as much or little as you want- or choose whatever veggies you have on hand- I had these and since they're already shredded, I went this route! 5. Drain it all! You are about to add your carb and you don't want it to get too soggy! 6. If you are doing the cauliflower, add it to your hot wok or pan and season it as you wish- I did garlic, sea salt and pepper. Pan fry it for a few minutes, then add your drained protein and veggies. 7. Scramble two eggs and add to the rest! Now add your soy sauce (we use Bragg's) to taste! 8. Garnish with cilantro and serve in your pineapple bowls! * I usually season the shrimp with spicy spices but since Oliver was eating it too, I added Sambal Sauce to mine! Hope I didn't miss a step and you enjoy it! There's something so very comforting about pancakes. On Sundays, my dad would make his special batch of pancakes- fluffy, buttery, round clouds of deliciousness. When Oliver was born, my mom and two sisters surprised me at the hospital. My dad was unable to make it because he was working (it was a Wednesday). But that Saturday morning, he arrived on my doorstep to meet his newest grandson. On Sunday morning, right before he had to leave, he made a huge batch of pancakes for us. It was the sweetest thing. Unfortunately, pancakes are not the healthiest breakfasts out there. I have experiemented endlessly with recipes ( a lot can be found here- just search pancakes), and finally have a base that seems to not fail me time after time. Mainly because it's so very easy and foulproof! I struggle with my recipe creations because I tend to not measure and go by taste and texture. A little of this, a little of that, and a lot of oh- that would be good in it! Haha! 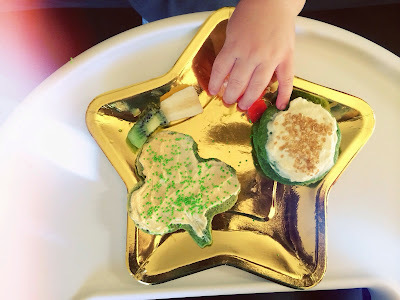 Check out this weekend's pancakes! 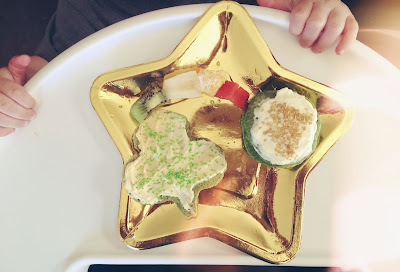 I made extra batches for today since it is St. Patrick's Day and green is a must! 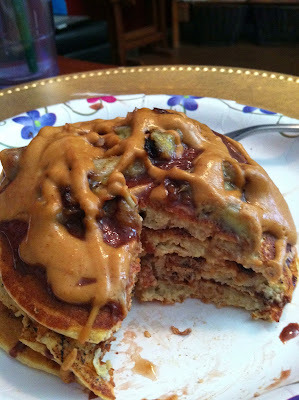 Fluffy, delicious, yummy, versatile, pancakes! Add old-fashioned oats to your blender and blend them (this is how I make my own oat flour. I buy an extra container of oats and it literally takes me less than 5 minutes to make a huge batch of oat flour that generally costs quadruple the price)! Add cottage cheese (The only cottage cheese I have found that is not filled with a shitton of weird ingredients is the Daisy brand). Add your egg whites (or whole eggs if you prefer); add spices, vanilla, baking powder and blend. 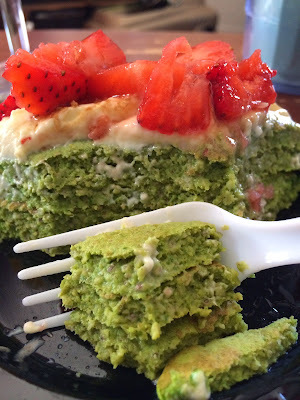 Finally, add as much spinach as your blender will still hold and blend away! 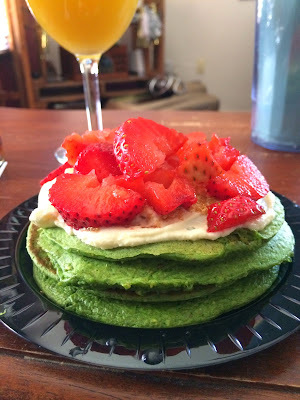 The spinach is optional depending on the type of pancakes you are trying to make but seriously, why not? Look at that fluffy perfection- & my fancy plasticware! extracts (think mint, butter, etc)! Greek yogurt/cottage cheese- have you ever had it together? It's the only way I eat my greek yogurt now! This particular picture has greek yogurt with 1 tbsp. of white chocolate no-sugar added jello pudding mix, a little bit of almond milk, dash of vanilla stevia, topped with fresh strawberries and sugar-free syrup! Yum! 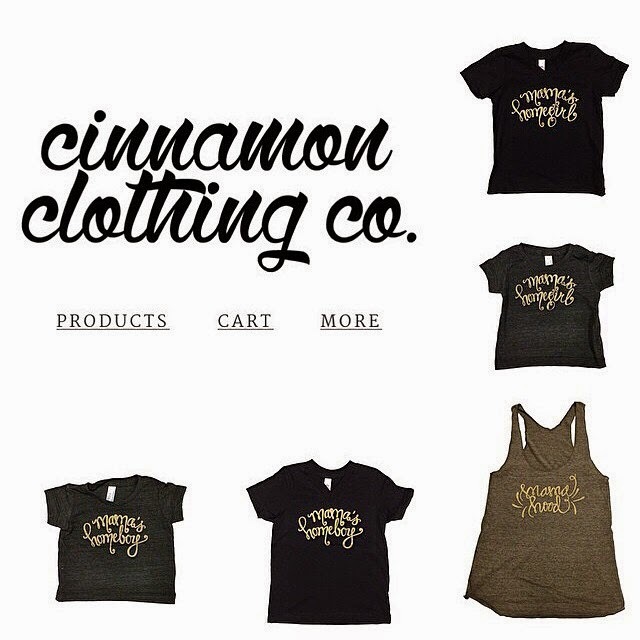 Experiment & enjoy! Happy St. Patrick's Day! 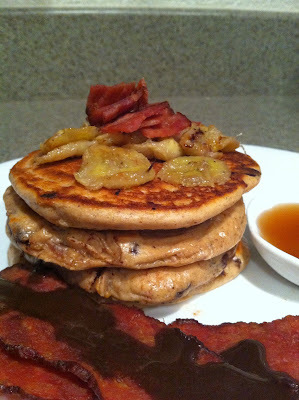 Elvis pancakes- peanut butter, chocolate chip, banana, turkey bacon pancakes for dinner! Hotdamn! 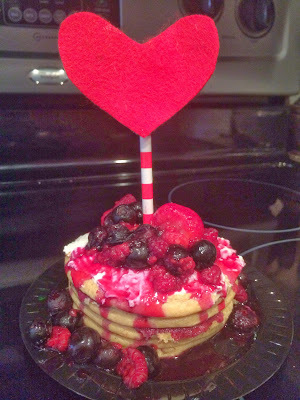 Buttermilk pancakes for Valentines day topped with greek yogurt and fresh berries and a berry jam (frozen berries, heated through and a tiny bit of stevia or honey added, then mashed)! 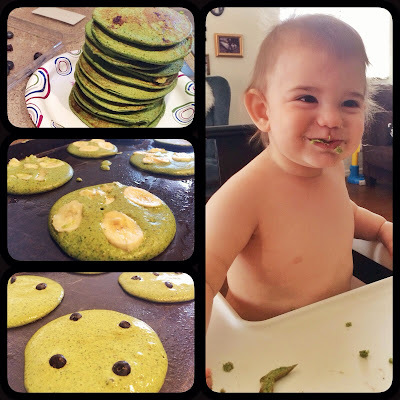 Blueberry and Banana Pancakes with Kale + Spinach! Baby approved! Anxious little baby hands eating the rainbow!